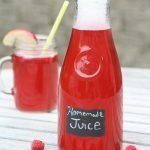 The apple, sweet peaches, red raspberries and sour cranberries make the most tasteful, tangy and sweet homemade juice. My mother in law made this kompot and said that someone told her, “mom you make kompot a lot but this one is by far the best.” I totally agree! Thanks to my wonderful mom in law who gave me the recipe and even brought some fresh cranberries over, I know thats so sweet of her:). I happened to use frozen peaches and raspberries for this juice that were thawed, but you can certainly use fresh ripe fruits instead. One glass of this will definitely show you the difference between store-bought and homemade. This makes a big batch but you can store this for weeks (if it will even last a week) in the fridge. I highly recommend a big juice jug with a spout to store juice in. It’s so convenient for big batches of juice like these and makes the pouring process much more enjoyable. For best results make a day in advance before serving to completely chill the juice. My husband certainly doesn’t mind drinking this warm but the preference is yours:) Comment & rate below! To begin, in a large pot bring 25 cups of water to a rolling boil. Then, add all the fruits and boil over medium-low heat for 15 min. After that, turn off stove; add the sugar; stir and allow juice to sit for another 20 min. 2. Finally, after the fruits sat in the water for 20 min; strain your juice. Discard any remnants and chill in a large jug or pitchers. Garnish with frozen or fresh fruits and enjoy! In a large pot bring 25 cups of water to a rolling boil. Add all the fruits and boil over medium-low heat for 15 min.Then turn off stove. Add the sugar; stir and allow juice to sit for another 20 min. When the fruits have sat in the water for 20 min, you can strain your juice.